I had penciled in targeting a PB (sub 58:35) at the Milton Keynes 10k a long while back. I’d had a good season so far and had managed to maintain my stay in Group 4 at running club. (Long time runner in group 5 right here!) I’d been moved up twice before, but each time returned to the slightly slower group after marathon training when my confidence faded and I lost my legs. When I checked the weather forecast earlier in the week and it was showing as due to hit 34 degrees on Tuesday I wiped all chances of a PB from my mind. I vaguely had the intention of downgrading my expectations to completing the 10k in under an hour but then when I woke up on Tuesday morning and there wasn’t a single cloud in the sky, my new target was just to survive the race without melting into a little puddle on the side of the road. My beautiful new fan was stolen from my classroom over the weekend and with the weather the way it has been this week the kids are really struggling to stay focused in the hot, sweaty classrooms. Well, not just the kids actually. Us teachers are struggling too! I hadn’t pre-entered the race on Tuesday so made sure to leave home nice and early so that I could sign up on the night. Despite my chances of an enjoyable race being rather slim I still wanted to give the race a good go. The course at Milton Keynes suits me as a runner. It is fairly flat, but with many, many redways dipping down and under various roads and back up the other side again. I like the variance of the course not being pancake flat and giving me the opportunity to relax a little on the slight downhills. The majority of the course runs alongside a dual carriageway but I can’t say I ever really noticed it. Lots of runners from our club hate that the course is very samey for the full 10k but I like to see it as broken into hundreds of tiny little sections from one redway underpass to the next. And there were a lot of underpasses! On the start line it appeared that we were all stood in the wrong position and facing the wrong direction, so we were shifted over to the left a bit and angled to face the edge of the field. There was no count down that I could hear. A whistle was blown and we just started running! Following our start, the whistle was blown repeatedly over and over again in short sharp bursts. There were mutterings of the possibility of a false start from runners around me and some even stopped running briefly before realising that the short, sharp blasts on the whistle were just meant as noise to encourage us on. The first little section is over the grassy field. I didn’t like this at all in road shoes and was glad it was only a brief portion of the course. We were soon out on a little back road and then onto the redways. My first mile was a little quicker than I thought I would be running at, ticking over in 8:46. As is usual lately, I didn’t display my pace on my Garmin but instead, my heart rate and overall time. Last night it was more important than ever to stick to heart rate rather than a pace so that I knew I wasn’t overdoing things and using up too much energy in the heat before blowing up later in the race. I decided to count to 100 over and over again (a little tip from Paula Radcliffe that I find helps me with consistency and focus!) and soon I was checking my watch against the 2k marker. This was out by Willen Lake. The lake that features on the marathon course and was the point I really struggled from when I ran the marathon back at the start of May this year. I put my head down, stuck to 165bpm and just kept pushing on. I overtook quite a few people along this section. At the 3k marker we came past a marshal, turned right and immediately headed underneath a bridge. I could see a lady Redwell runner had semi-fallen into a seated position out on the course here so shouted ‘Runner down!’ back to where the marshal was stood. I’m not sure he heard me but another Redwell runner was by the lady’s side by this point and said that she was OK. I felt a bit guilty for not stopping, but there wouldn’t have been anything that I could have done anyway. I found it very confusing with my watch giving me mile splits alongside trying to check the km splits on route which I then compared to the overall time shown on my Garmin. When I got to the halfway point in 28:44 I worked out that I was on target for a PB if I continued at the steady pace that I was currently running at so chose to skip the drinks station. It was tough, but my HRM told me that I was capable of running in the heat it so I just kept counting to 100 over and over and putting my feet down one in front of the other. A little after the 9k marker you head out onto a road that runs through the University. From memory it wasn’t far until the finish from this point so I extended my stride. Despite it being so warm and draining out there, I’d paced myself well and was able to stretch out and pass a lot of runners here. The sign appeared in the distance for 200m to go. No, it wasn’t 200m to go. It was 500m to go! What?! I’d never make it now! All thoughts of a potential PB left my mind as I succumbed to being so close but just not achieving what I had initially set out to do. I almost slowed my pace right down but caught myself and kept the rythym. I can’t imagine I displayed a very attractive face at his point though. There was a lot of scowling going on! As I turned onto the field where the finish line was visible in the distance I just caught sight of the clock on the line. It had just turned over to 58 minutes. My legs and arms pumped away and I powered towards that line. I WAS getting my PB after all! For a brief second I thought the sign by the clock read Finish, 200m and I could have cried! Luckily the sign actually read Finish Line. Woop woop! My watch read 58:25. The official time showing on the website this morning was 58:27. Not a huge PB but still a PB and a massive improvement on my course time from last year. Position: 430/487 Gender position: 111/144 Category position (SF): 29/40. 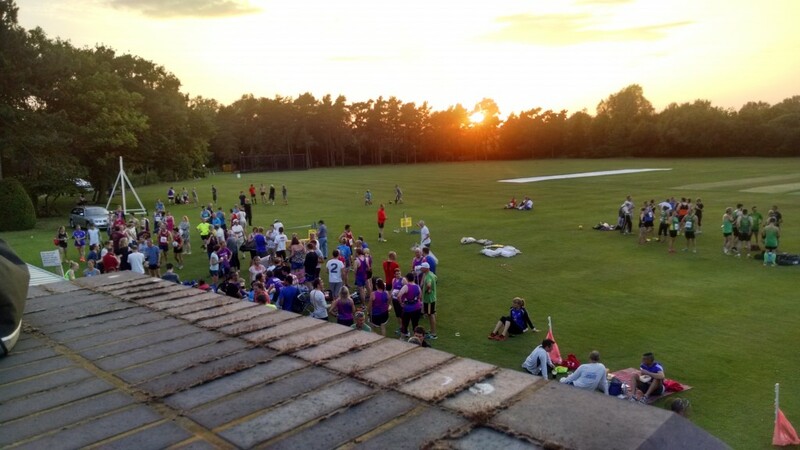 Because Milton Keynes 10k was the last of eight races in the East Midlands Grand Prix series, the overall prize giving took place as the sun was going down. Bed time for me last night was gone 11:30pm. I was a sleepy teacher today! Do you prefer running in the heat or the cold? Have you convinced yourself that you haven’t achieved a PB only to discover that you have?! Congratulations! Given the ridiculous heat I think you could have easily smashed your PB on a cooler day. I ran that evening too and felt like it was 100xs harder than normal. Not just from the air temperature but from the heat radiating off the ground, ridiculous! For Lordshill 10k I honestly wasn’t sure I would PB or not because, like you found, to do the mental maths later in the race is just impossible! It’s always nice to have those “300m to go” or whatever countdowns because then you know when to push or for how long you need to be holding on for. I hate it when you turn round the corner to find the finish line is right there and you could have pushed a tiny bit harder, or the opposite where you start pushing as some numpty says “the finish is just round that bend” to find it’s actually half a mile up the road! The Tuesday and Wednesday of last week were so tough going! Glad things seem to have cooled off a bit now. I also hate when you have no warning where the finish line is going to be! One of the short distance races I ran last year was quite close to my PB and although I don’t think I would have hit it knowing how far I had left to go I would definitely have picked up the pace much sooner than I did. In that heat as well, it was so tough! I went on a run Tuesday night and it was a battle to put my sports bra on because I was so sweaty from being in a boiling classroom all day! I much prefer the spring and autumn- that is when I tend to get pbs- in the summer I don’t even try for them because there is no point for me! I am going to Willen lake on Sunday for the Wr10k! Thanks Maria. I’m so glad it’s been a bit cooler since then! I am all about running in the Spring and Autumn. In fact I haven’t run much during the Summer the past few years – last year we were on honeymoon, the year before I was injured and the year before that I was running, but whilst away in Africa! Hope you enjoyed the 10k on Sunday. There seem to be a lot of races around Willen Lake! A PB is a PB, and I have no doubt that you can go faster given less hideous conditions! I have no idea how you ran a 10K in that kind of heat, let alone at PB pace. Heck, I’m struggling after a mile sometimes at the moment. I hope to goodness it cools down at some point. I much prefer the cold. However, I can’t keep my balance on even the tiniest amount of ice. Therefore, I have a decent running window from about March to June, then September to November. I hate the other months with a passion! 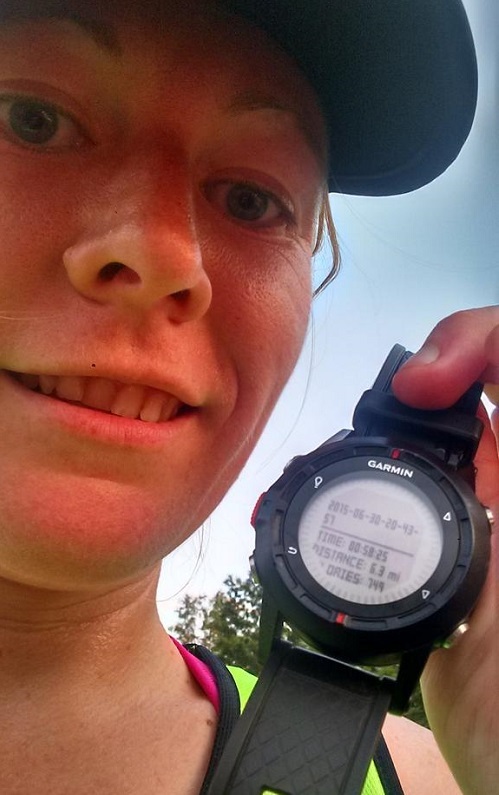 Jess @ One Step Closer recently posted…Questioning My (Running) Decisions? Thankfully, it does seem to have cooled now somewhat. Why does it always end up being super hot when I race?!?! I prefer the cold as well. Although, like you get so frustrated when it’s icy outside. Running on a treadmill is just not the same! Well done! Great job on pb. Give me running in the cold anyday haha, the heat is so draining.